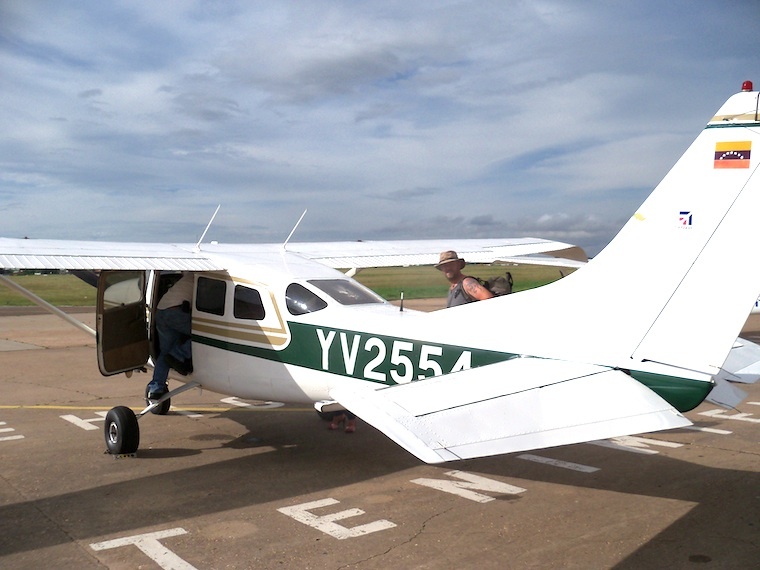 This six-seater Cessna is the only way to get to the world’s highest waterfall, so we strap down our misgivings extra tightly and take the ride from Cuidad Bolivar, a pretty colonial town on the banks of the Orinoco, a river that begins and ends in Venezuela, winding its way around the massive Guiana Shield to spill into the Caribbean Sea. 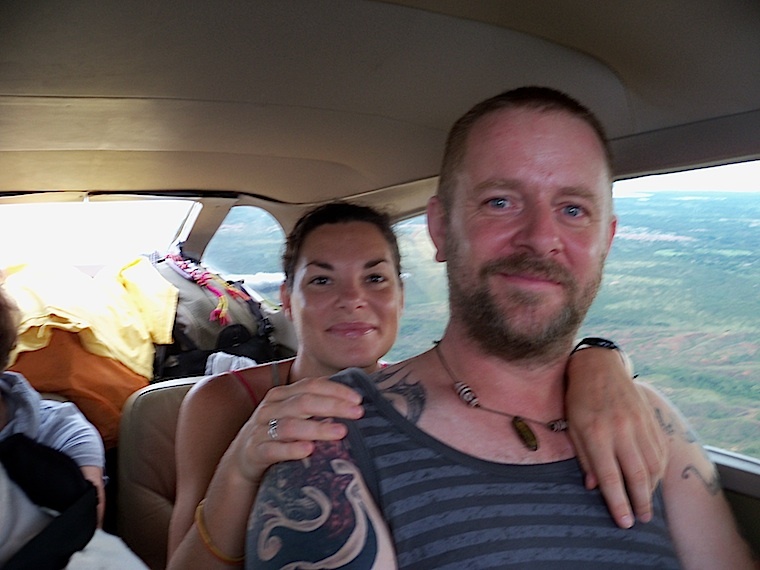 We fly over the broccoli of dense jungle, which is periodically scarred by slash and burn incursions for cattle ranching of mining. 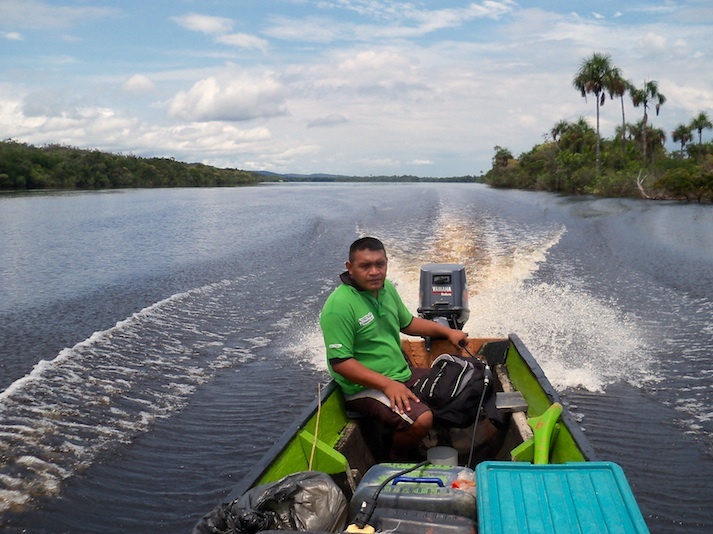 For a time, the forest is dissolved into an expanse of water, a huge lake that was created in the 1960s for the Guri hydrodam project, the world’s fourth largest hydro-power plant and a great income generator for Venezuela, which sells the energy to Brazil and Colombia. 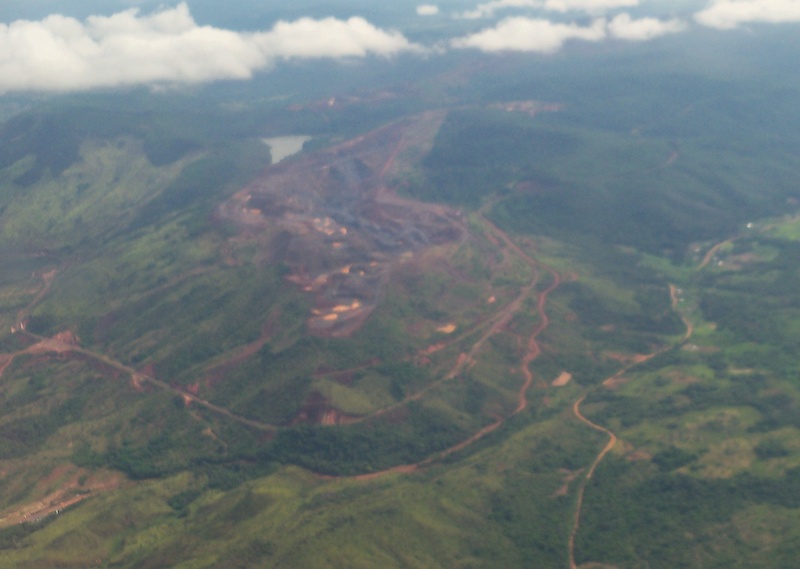 Open-cast mining scars the jungle. Venezuela is rich in pretty much every mineral from gold to diamonds. 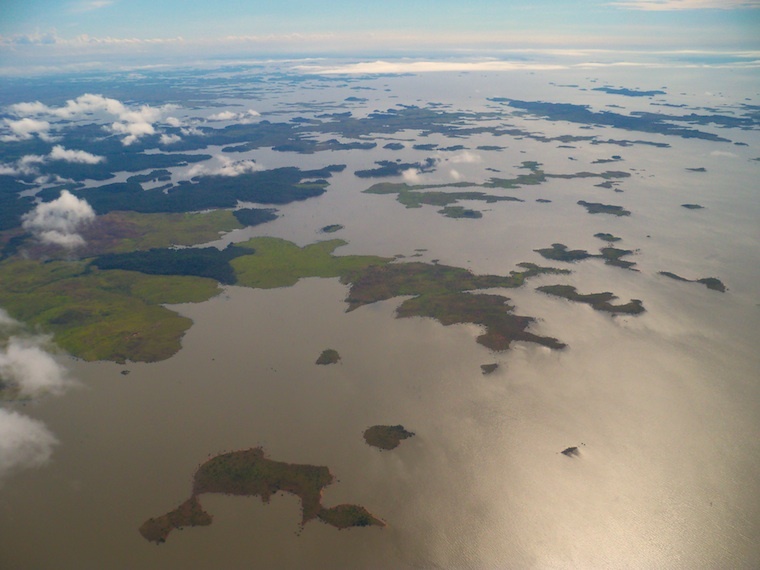 Cunstruction of the Guri hydrodam flooded hundreds of acres of rainforest. 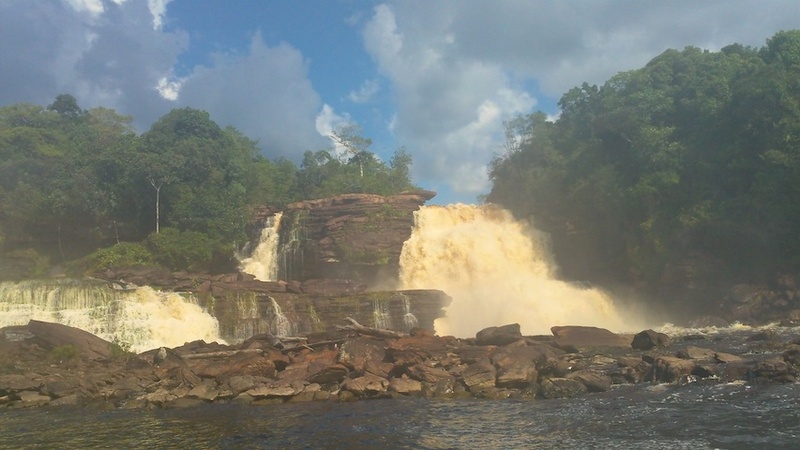 We land in Canaima, a tiny village of Pemón Indians, where men play dominos at wooden tables in the shade and women knit seeds together on strings to sell to the few tourists that still visit super-dangerous Venezuela. 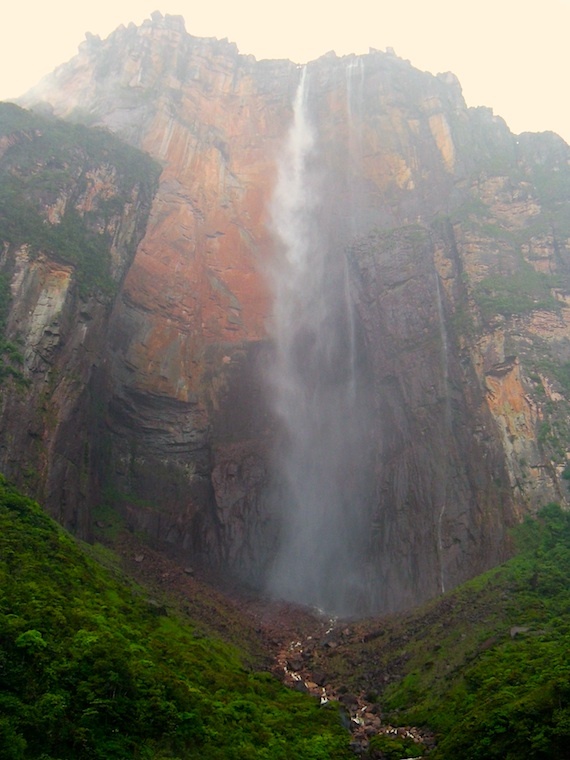 Angel Falls is the country’s premier tourist attraction, but numbers are way down. 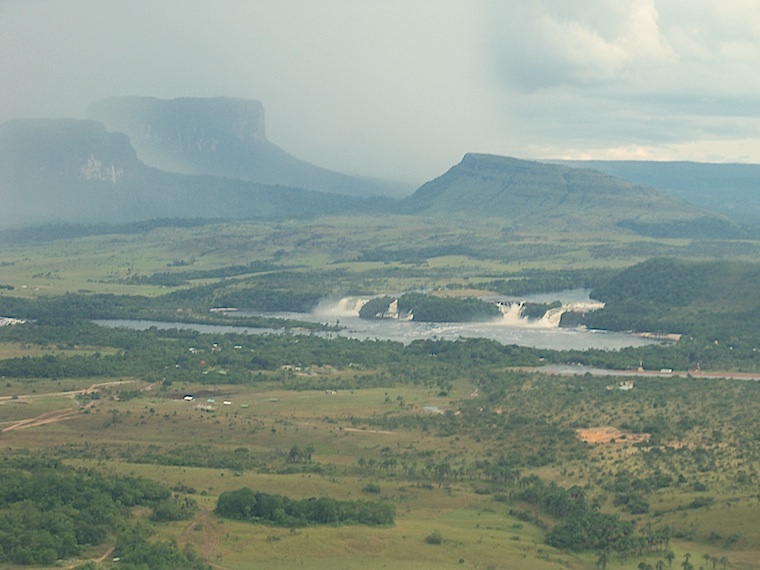 We stay in a posada overlooking Canaima’s beautiful lagoon, surrounded by palm trees and a stunning series of seven cascades that pummel the lake after several days of heavy rain. 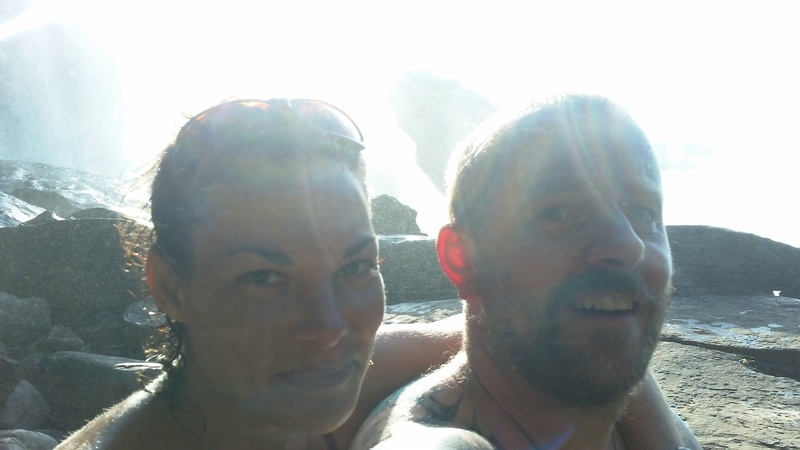 We take a boat across the lagoon to the waterfalls and walk on a slippery path behind their curtains of water. It’s loud and exhilarating to be so close to the powerful torrent that never ends. 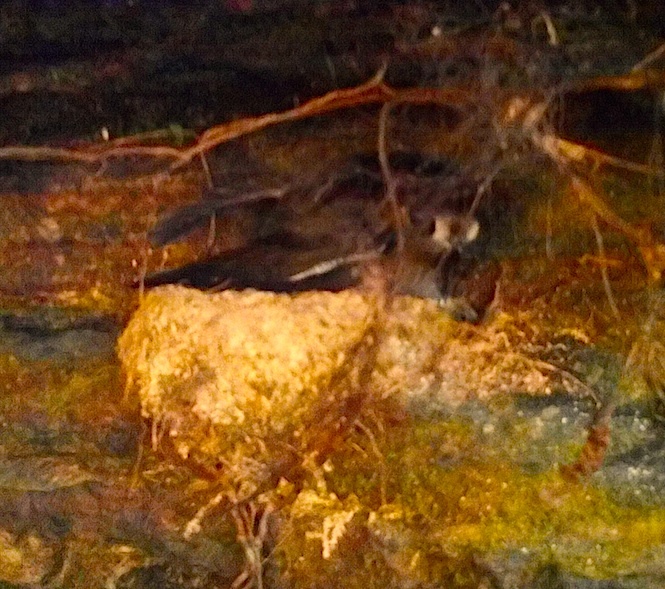 We find a swift fledgling sitting in her nest, sheltered underneath the falling water, waiting to learn to fly. 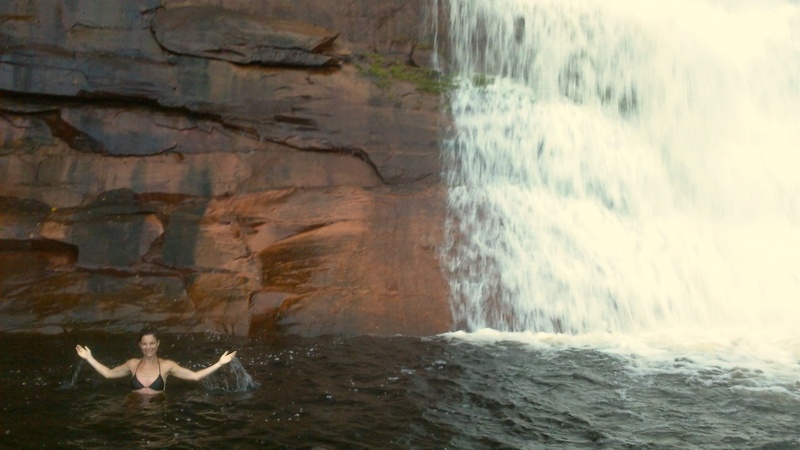 Her mother visits a few times while we are there, braving the dangerous cascades to steer between hammering shutes of falling water to bring the chick supplies. 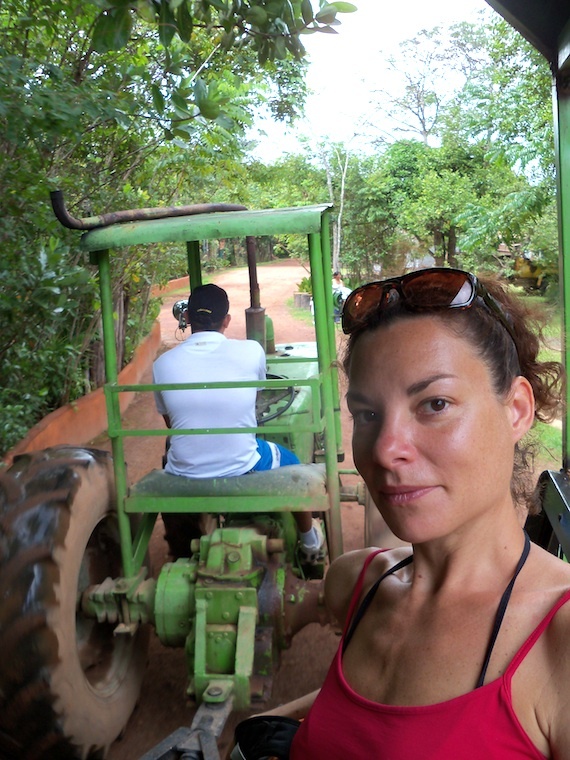 Next day, we board a motorised canoe to travel up the Rio Carrao to the Angel Falls. 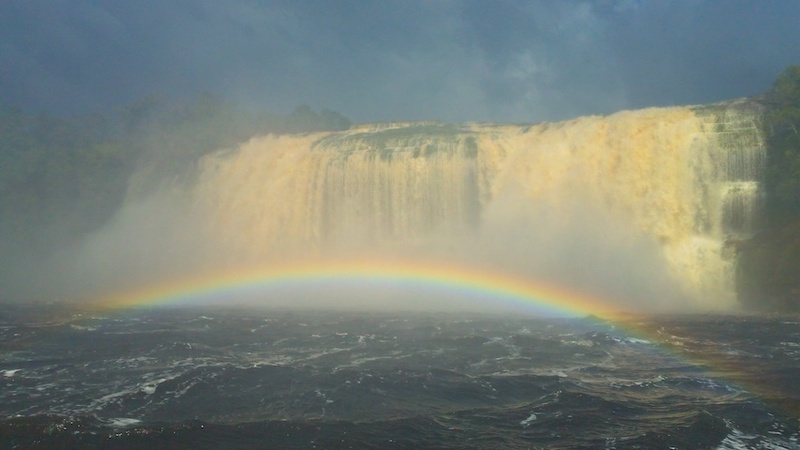 It’s a full-day’s journey, traversing rapids that drench the boat, passing swimming holes and sculptural boulders, overseen by a backdrop of monumental tepuis. 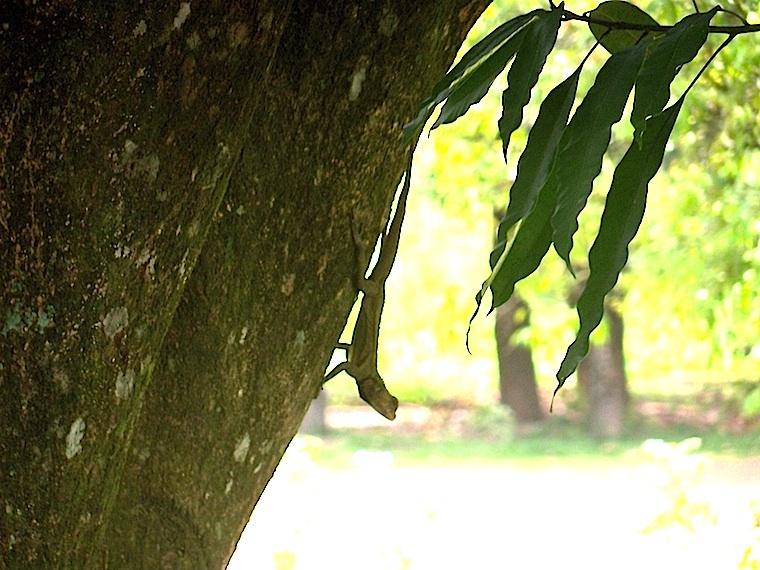 On each bank, the rainforest sings with birdsong, insects and frogs. The air is sweet with rotting fruit and sticky flowers. 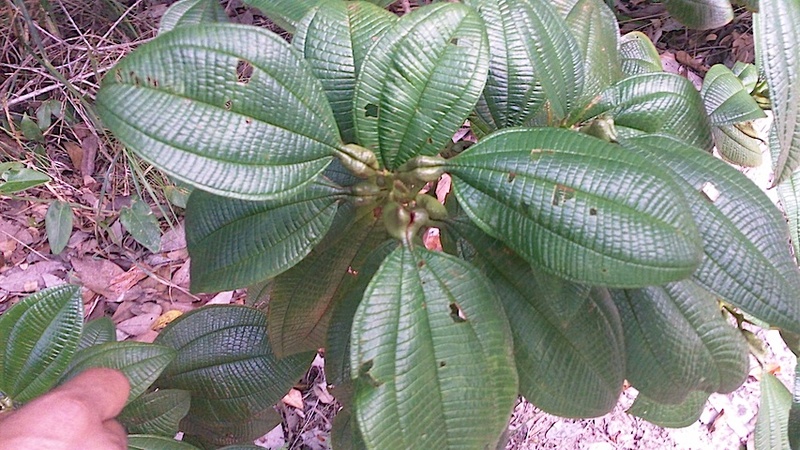 The bulges at the base of this plant´s leaves are nests for ants, which live on the plant and fight off its insect threats. Everyone´s a winner. A snake swims across the river in front of us, head high, lithe body undulating in waves that transport it to the other bank impossibly fast, in a motion that seems to defy the laws of physics. 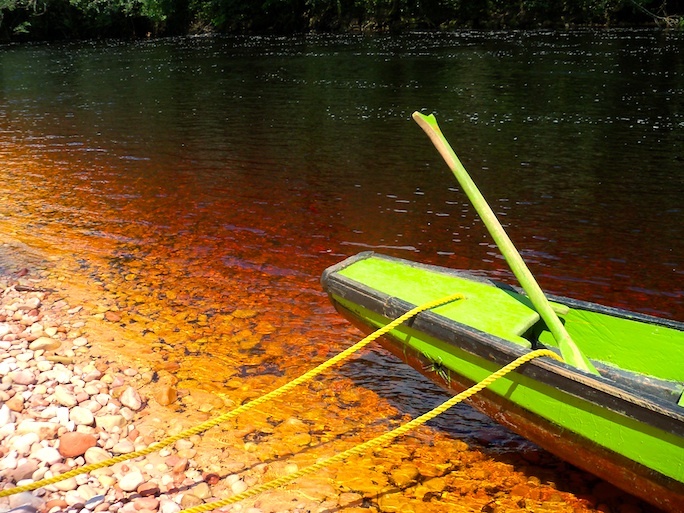 The water is richly coloured, from the wine of Homer’s seas to the golden hues of tea and rusty autumnal leaves. 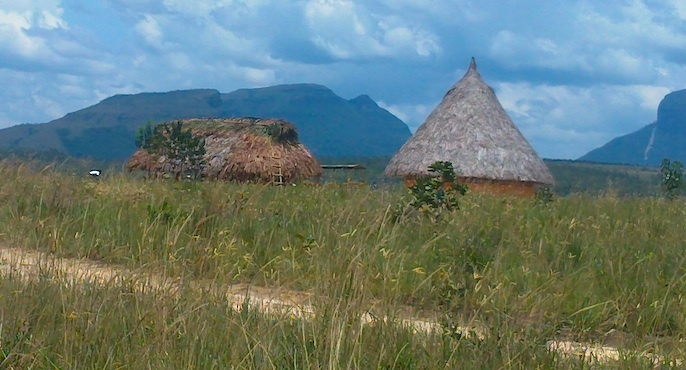 It comes this colour owing to the pink and copper rocks high on the tepui cliffs. In the clear water, fish are easily visible, swimming among the pebbles and nibbling at our mosquito bites when we wade in. 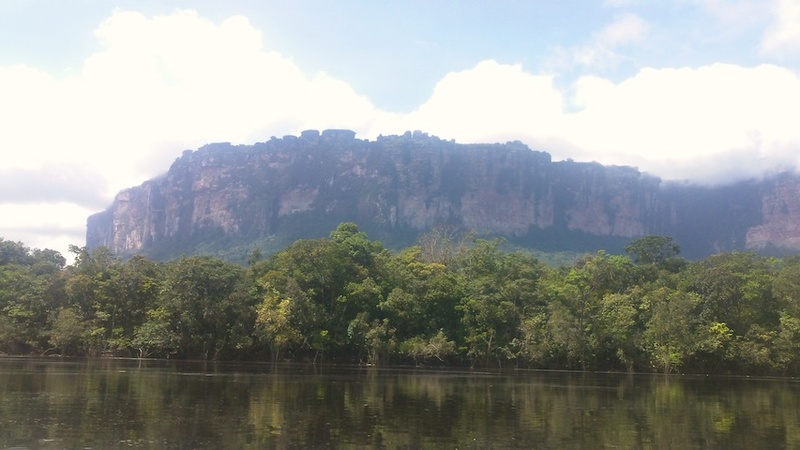 Above us, the tepuis carve castellations into the sky. 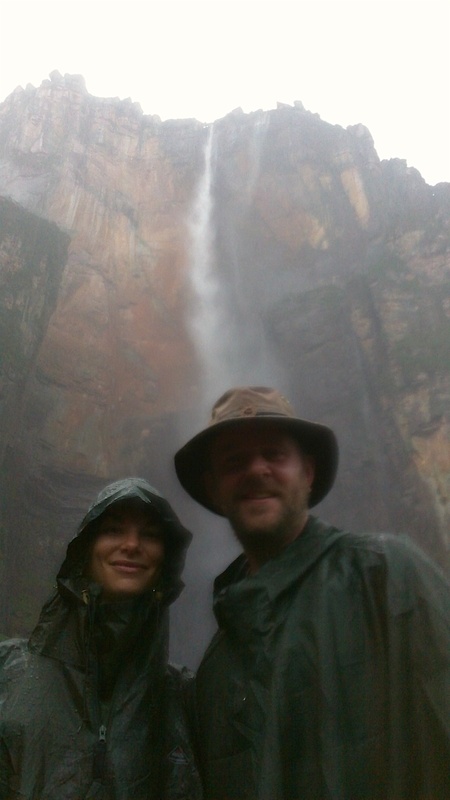 And finally, we round a bend and see the world’s highest waterfall, spilling from the top of Auyantepui, to land 979 metres below. It has an uninterrupted drop of 807m – 16 times the height of Niagara Falls. 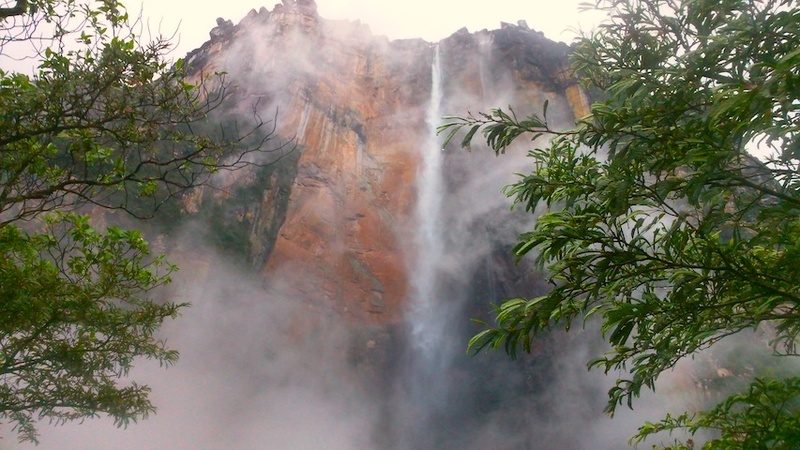 Over this kilometre drop, the water that tips so uniformly off the high tepui seems to shatter into a spray of cloud and rain. 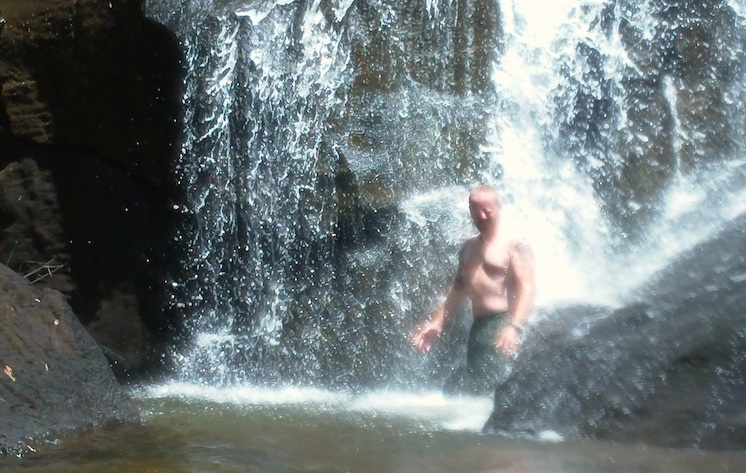 From the base of this towering waterfall, emerges a seemingly stronger and more richer cascade, which pours over the rocks into a pool and then disappears into a deep crevice. 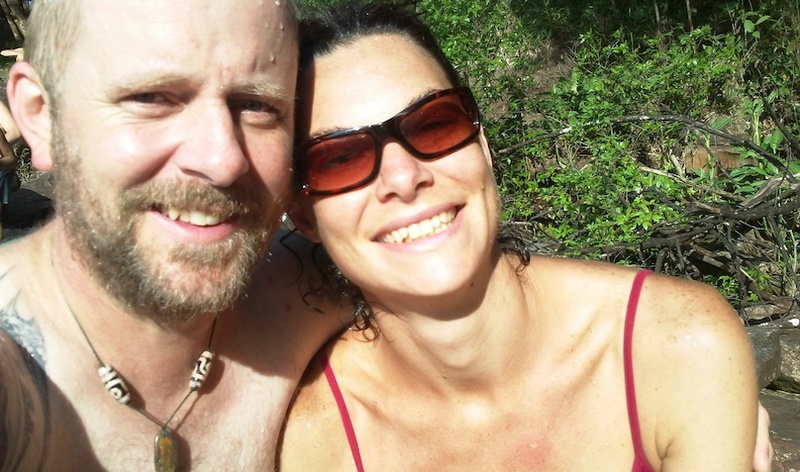 We bathe in the pool, swimming under the highest waterfall, keeping safely away from the actual cascades. Mosquitos lurk at the edge, waiting to drink from our exposed skin, and a wasp stings me painfully on the chest. We see the high falls – named for a US gold hunter, who ‘discovered’ them when he landed his plane on the tepui and had to be rescued 12 days later by his action-hero Venezuelan co-pilot – only briefly. Cloud rises from below and obscures them completely in minutes. But they were worth the glimpse, and a fitting way to celebrate our 22nd month on the road. Jimmy Angel´s plane. 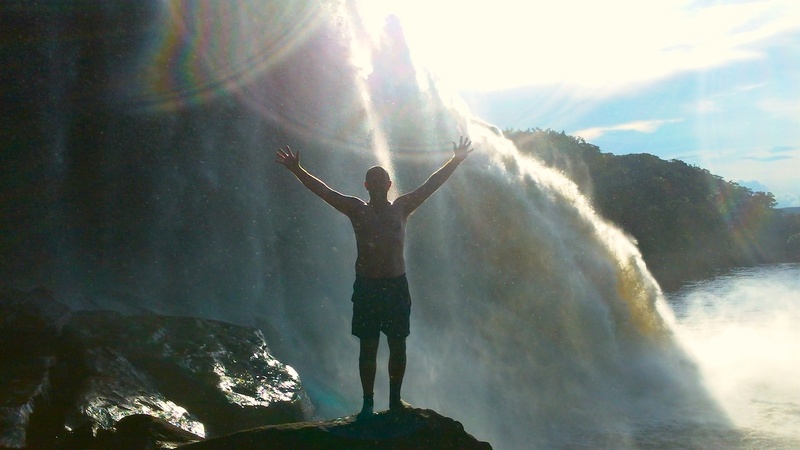 He landed it on top of the tepui while looking for gold but finding the world´s highest waterfall. What an amazing place – how I’d love to be there too!! Broccoli of rainforest -nice turn of phrase! 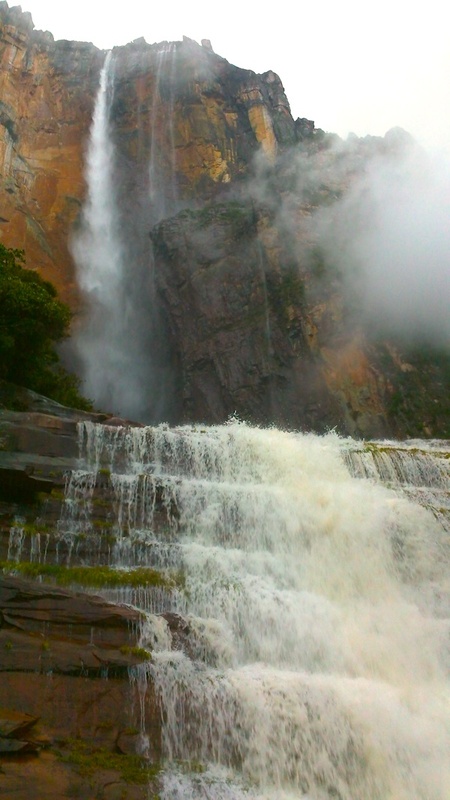 Agreed , Angel falls is one of the most lovely place, which worth seeing, Been there with my friends we were mesmerized with its beauty! it was like dreaming, It is always be in my Top 10 sights list. My friends & I so much involved in the beauty that we didn’t speak for hours. It was really breathtaking experience. Hello! Just loved your pictures. What a wonderful world we live in. 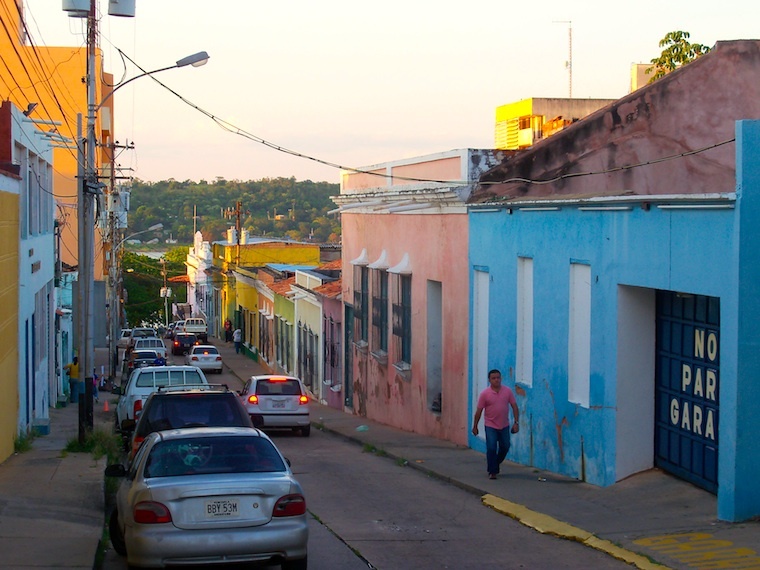 I am a brazilian travelling through Venezuela and right now in Puerto Ayacucho, Amazonas. 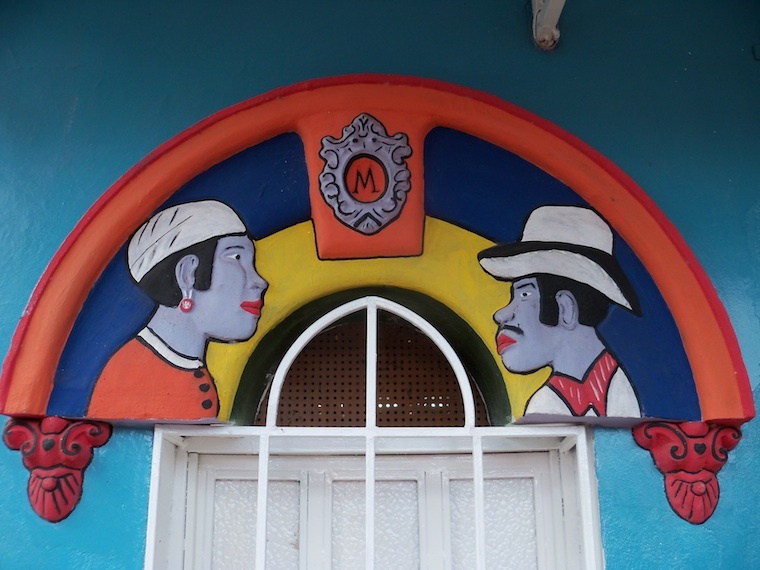 Do you think we can go from Ayacucho to Ciudad Bolivar…Any tips…Thanks! 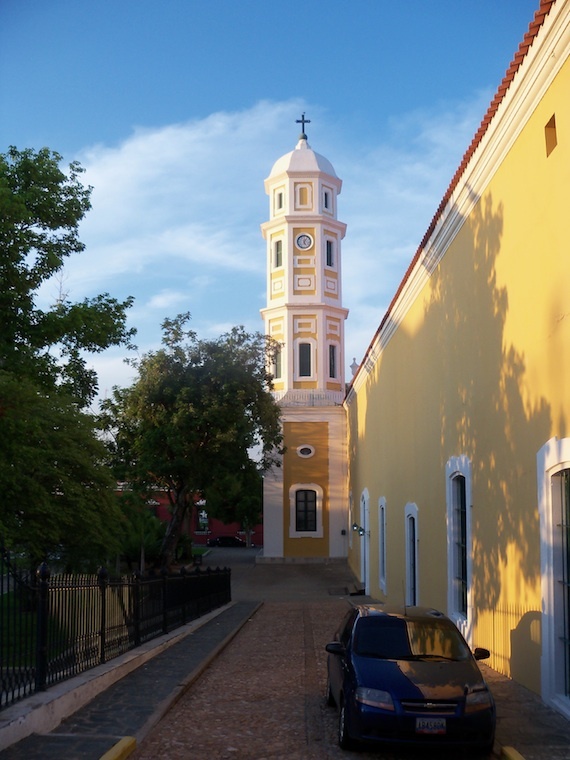 Hello Antonio, have a wonderful trip – I’m afraid I can’t remember the bus routes, but I know that Ciudad Bolivar has regular services, so it shouldn’t be too tricky.